I had an interesting sail in The Clyde and the South West this year. The canal trips were a bit expensive - a return trip through the Caledonian, and one through the Crinan - which I hadn't tried before. It's very pretty, and more like a narrow boat trip. I was mostly on my own but sometimes had one or two crew. I spend a nostalgic few days in The Clyde, where I had haven't sailed since I was last on a sailing course there in 1992 (John Major's re-election was a notable event of that week - the somewhat left wing crew and the ex RN skipper both displaying a good deal of tact and consideration). I also visited some relatives I haven't seen for far too long. Other highlights included Arran, Islay, Colonsay, Jura, Staffa, Tiree, Sound of Iona, Mull, Loch Etive, and Loch Eil. 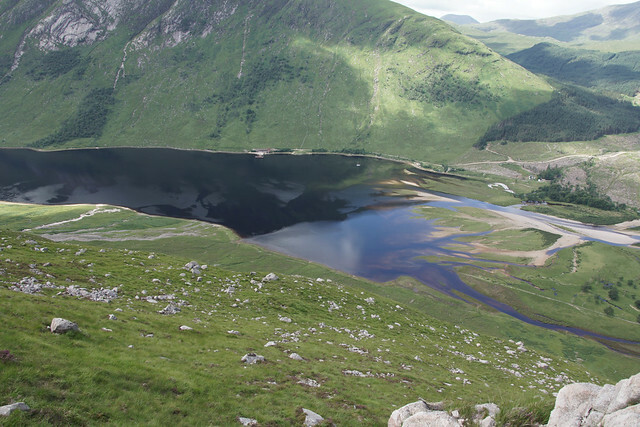 It was taken from two or three hundred metres up a hillside on south side of Loch Etive. Raasay is a visible speck, and you can pick out the dinghy on the near shore with some patience. Follow the link to the full size file on flickr if you have nothing better to do! The charts show an anchorage, but I think it's mostly rock and weed. I had spent the night there before going for my walk, so things could have been worse. I'm sure I'd have wakened up if I had dragged earlier, but I'd rather not think about it.